Ecolibrium Solar’s COO Sam Veague will speak at Greentech Media’s 10th annual Solar Summit in Scottsdale, Arizona, May 16-18. Veague joins the panel discussion, “What's Next for Residential Rooftop Racking?”. In addition to Veague, panelists include David Briggs, Vice President of Marketing, IronRidge Inc., Brandon Carrasco, Senior Product Manager, Unirac. The discussion will be moderated by Benjamin Gallagher, Analyst, Solar, GTM Research. 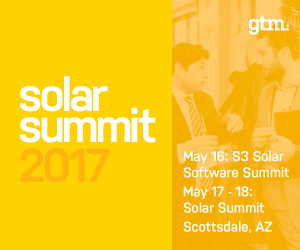 Solar Summit 2017 offers a packed agenda of notable persons in the solar industry discussing topics including solar software, energy storage, finance, community solar, corporate procurement, balance of systems, and much more. Take advantage of a 20 percent discount with speaker code SPK20. Learn more about Solar Summit at http://bit.ly/2q84Ujs and more about Ecolibrium Solar at www.EcolibriumSolar.com.